His current information included a lot of discussion of people who had been wrongly convicted due to misapplication of “justice.” Personally, although I think wrongful convictions are horrible, I believe they are so rare that he should have spent more time focusing on other injustices – like the fact that a drug kingpin, once caught, can provide names of everyone beneath him so that those people have no one to snitch on. Such miscarriages of justice mean that the kingpin gets a greatly reduced sentence and the people below him get regular-to-maximum sentence. That’s the type of thing I wanted to hear about, so I could complain about the justice system in a more informed manner. 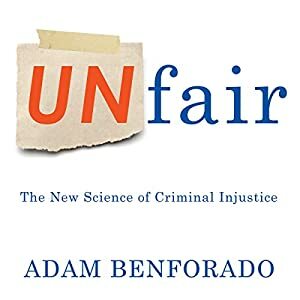 🙂 Benforado also spent a lot of time discussing natural human bias – such as the fact that a person’s appearance, history, socioeconomic background, etc. affects the jury’s perception of guilt. In his scientific discussion, he told the reader about current breakthroughs in lie detection (such as brain scans), which, although promising, need a lot of work. The author pointed out that jurors are much too likely to accept this “scientific evidence” as truth just because brain scans seem to be indisputable. Overall, Unfair was interesting, despite focusing too much on the rare cases of wrongful convictions. The book was well-paced, interesting, and intelligent. It leaves the reader plenty to think about. Great commentary as always Rachel. I really like the fact that you thought about this critically and identified what seems to be a more serious problems in the system. “He pointed out that our concept of justice will continue evolving so that in 100 years our own criminal system will seem as preposterous and horrific as a witch hunt. “< -Having just finished reading Just Mercy, I very much hope you're right!